How much is that doggie on the plinth there? The one with the non-waggy tail? 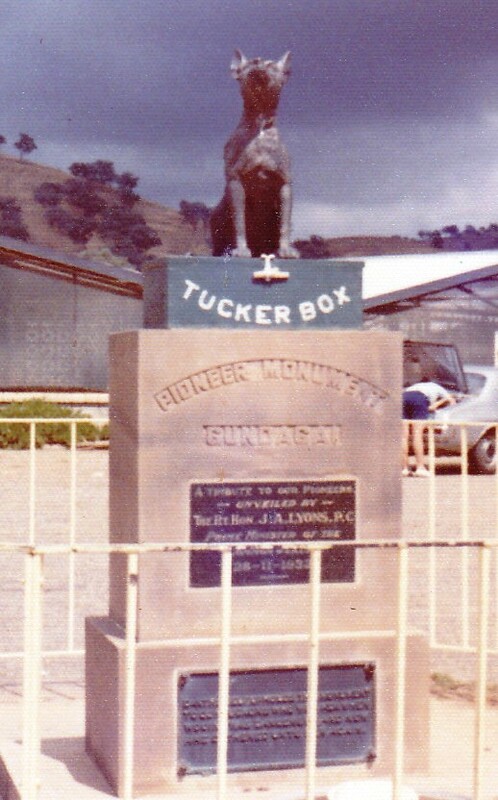 The Dog on the Tuckerbox is an Australian historical monument and tourist attraction, located at Snake Gully, five miles (8 km) from Gundagai, New South Wales. The dog section of the monument was cast in bronze by ‘Oliver’s Foundry’ in Sydney and its base sculpted by Gundagai stonemason Frank Rusconi. It was unveiled on 28 November 1932 as a tribute to early pioneers. This statue recently celebrated its 80th anniversary. The statue was inspired by a bullock driver’s poem, Bullocky Bill, (written by the pen-named poet “Bowyang Yorke”) in 1857, which celebrates the life of a mythical driver’s dog that loyally guarded the man’s tuckerbox (Australian slang for lunch box). Jack Moses used this poem to build upon his own composition “Nine Miles from Gundagai” which was first published in 1938 several years after the statue’s unveiling. Sadly I have to report that a food court style development opened nearby in 2006 with a KFC, Subway, McCafe, BP service station and Tuckerbox restaurant. What a sad indictment – Pal. This entry was posted in QuestionableArt, Sculpture, StreetFurniture and tagged Bowyang Yorke, Bullocky Bill, Dog on the Tuckerbox, Gundagai, Jack Moses. Bookmark the permalink. 2 Responses to How much is that doggie on the plinth there? Many thanks for your recognition. I hope you continue to enjoy my offerings.